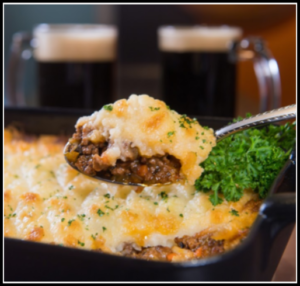 Image of Beef Shepherd’s Pie with Porter taken for the Beer Institute. Recipe was created by Chef Laurent Aubel. In a medium size sauté pan add olive oil over high heat. Add ground beef breaking it up with a wooden spatula. Cook until brown, approximately 7-8 minutes. Drain excess fat and return beef to the pan adding onions, garlic, celery, and carrots. Turn heat down to medium-low and cook until onion soften. Add ½ cup porter beer and simmer for 5-7 minutes, further reducing the liquid. Add vegetable stock thyme, and bay leaf. Turn heat down to low and cover. Stirring occasionally, cook for 25 minutes. In a medium pot, add potatoes and top with cold water (just enough to cover potatoes, and a pinch of salt. Bring to a boil and then turn heat down to medium and cook until potatoes are soft, approximately 10-12 minutes. Drain potatoes and let dry for 15 minutes. Pour heavy cream and butter into a small saucepan. Heat over low heat until butter is melted. Pour cream mixture over the potatoes – puree until smooth. Season with salt and pepper to taste. In an 8-inch x 8-inch baking dish add meat and vegetable mixture and spread evenly. Top with mashed potatoes, spreading evenly all the way to the corners. This will seal in the meat mixture and prevent a boil-over. Bake in oven for approximately 25 minutes or until potatoes are slightly browned.